In my previous post, I described my content model. In this model, each post could be manually classified against one or more tags (similar to how one would do it on Blogger). The tags are stored as part of the Alfresco's taxonomy and shared between bloggers (we could have had this be private to each blogger also, but given that the idea of tagging is to build a shared folksonomy, I thought it would be better to have them be shared). I pulled three Atom feeds for my example - one from my own blog, and two others from friends who also write on blogger. Then I parsed out the categories from the feeds and wrote out a de-duplicated set of tags from all three blogs out into a flat file. To parse the feeds, I used StAX - here is the code. One thing that I've started doing recently is embed the @Test method in the main class itself, similar to how some people put in a main() method for testing. This is particularly useful if all you want the test to do is to run your class. That way, you can use a single Ant target to run all your classes, instead of having specific ones for each class. Here is the unittest target. Inserting the categories into Alfresco proved a bit trickier. There was no code example that I could find, either in Jeff Pott's book or on the web. One way to do this is to manually add your categories in the alfresco/bootstrap/categories.xml, reinitialize the database and data directories, then startup the Alfresco web application. I suppose I could have done this, but it seemed a bit of overkill to me. To add categories to the cm:generalclassifiable classification, there first needs to be a node of type cm:category with a child association QName of cm:generalclassifiable and child association type cm:categories beneath a node of type cm:category_root. This node is the top of the classification. Nodes can be created beneath this node of type cm:category and child association type cm:subcategories. These nodes defined the root categories for the classification. Further nodes of type cm:category and child association type cm:subcategories can be added beneath these nodes to define the category hierarchy. Secondary links can be used to include categories from one classification in another - these category nodes appear in both classifications. The category property and its defining aspect determines which classification applies. Pretty simple, right? Yeah, I thought so too :-). But it does make sense if you read this really carefully, at the same time referring to the categories.xml file. The wiki page said to look at the unit tests to see how the above should be done - the one I found was ADMLuceneCategoryTest - it wasn't exactly what I was looking for, but it did give me some useful pointers on how to go about doing this. Based on the code in here, I decided to use the Alfresco Foundation API. The one disadvantage of using the Foundation API is that it takes a while for the ApplicationContext to spin up. But an advantage is that you can do this without the web application running (in fact, with the application running, it complained about port 50501 being already in use - but I believe that is something Mac OS specific). It would probably have been quicker to use one of the remote APIs to do this. Since I plan on using that anyway once I build the client for the CMS users, I decided to use the Foundation API for now. Here is the code to load the categories from the flat file generated in the previous step. 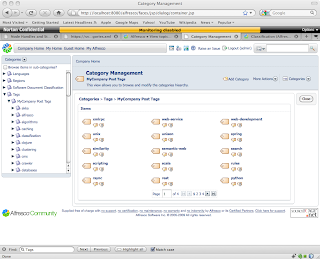 After running this, I can verify that the categories made it in on the Alfresco webapp's Admin console. 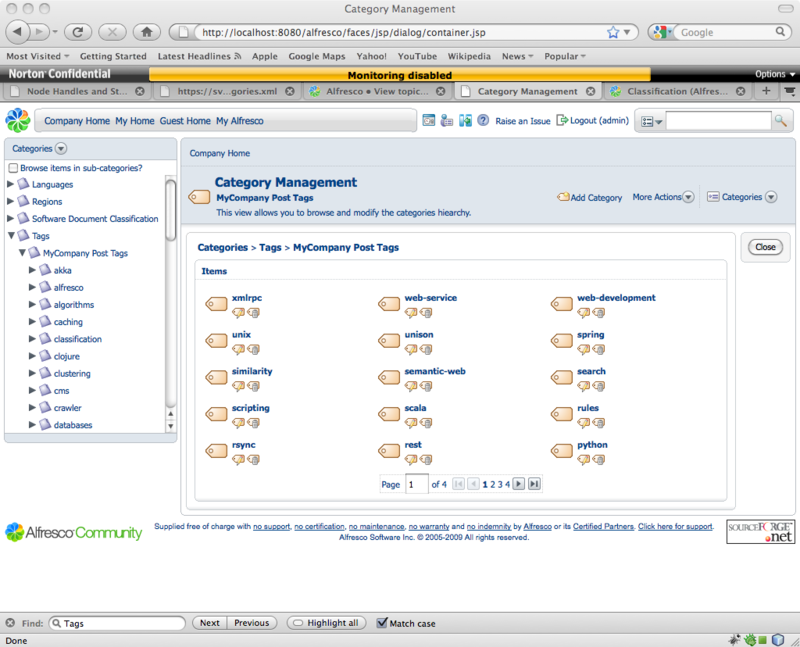 The left panel shows the category hierarchy, while the right panel shows a icon view of the various categories that were just inserted. The breadcrumb above also shows the relative position of these category tag elements. Categories are to Alfresco what Taxonomies are to Drupal. Once you understand how to load categories, it seems to be fairly simple to work with. You can nest categories to any depth as well (see the categories.xml for how to do this). For comparison, Drupal does this with 4 database tables - 3 to define the taxonomy and term itself, and the fourth one to map the node to the term. Not that there are no warts with Drupal's implementation (there are 3 different ways the node->taxonomy element can be structured, depending on the type of taxonomy being used), but Drupal's approach seems simpler and more intuitive to me. That said, one thing I do like about Alfresco's approach is its unified approach to category and content - both are nodes. I had a bug in the loading code, I forgot to add the aspect to the category node as I was loading it. I also added a verification step in the loader that runs against Alfresco's Lucene index once the loading is complete, and verifies that the number of categories in the input file are the same as that in Alfresco. The code has been updated in the main post. The second thing I noticed was that I was creating a new alf_data in my project - this was because the dir.root was set to ./alf_data. I guess the reason I could see it in Alfresco's web client was because it comes from the database. I updated the dir.root directly in repository.properties and added that as a system property in my Ant task. The XML for the Ant task has also been updated in the main post. When trying to link a post to a category, I found that I had marked the categories with the my:tagClassifiable aspect. There should be no aspect applied to the category, it should be applied to the my:post content instead. The CategoryLoader code has been updated with this information. In addition, there is code to delete all the categories (since I had to do this before I reran).